The parakeets that have invaded Europe and North America over the last forty to fifty years, creating massive nests in many urban areas, seem to have originated from the same small geographical area in South America. In addition, the invasive populations are genetically identical and are recognised by a relatively rare dominant haplotype in the source population. This has been the conclusion of an international study in which Spanish scientists have participated. The monk parakeet (Myiopsitta monachus), also known as the quaker parrot, is considered one of the most invasive bird species on the whole planet. Hundreds of thousands of them have been imported as pets over recent decades and their feral populations started to become an invasive species in the U.S.. in the 1960s and in Europe in the 1980s. However, these two independent populations seem to have originated from the same area of natural habitat, probably located between the south of Brazil (Río Grande do Sul), Argentina (Entre Ríos) and Uruguay, according to a study published in the journal Molecular Ecology in which the Doñana Biological Station (EBD-CSIC), the Pablo de Olavide University in Seville (UPO) and the Natural Science Museum in Barcelona have also participated. 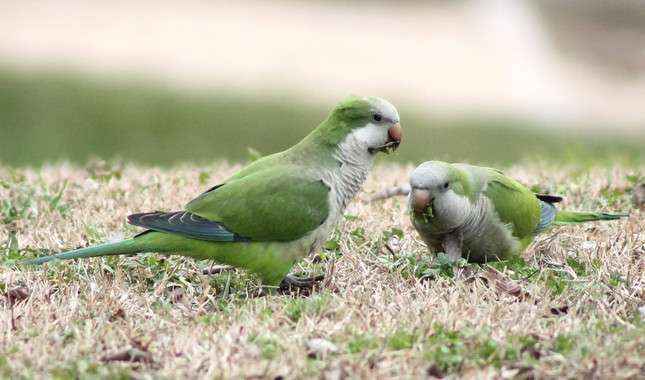 "For the study we used genetic information obtained from mitochondrial DNA and microsatellites to evaluate the genetic variability of the native area, South America, as well as three invaded areas located on three continents (North America, Europe and Africa) for the invasive species the monk parakeet Myiopsitta monachus," Martina Carrete, co-author of the study and researcher for EDB and the UPO, explains to SINC. Exotic invasive species are a fundamental component of global change and one of the main causes of native species dying out. It is for this reason that the variables determining the success of the establishment of such species have been studied from multiple perspectives. "Among other things, the existence of genetic variability is thought to be important, although there is no clear consensus on how this variability in the source populations and demographic processes affect the success of invasive species establishing themselves," Carrete adds. The parakeets have been sold across the world as pets for years and have established invasive populations in many areas. "In particular, we evaluate whether the genetic diversity of invaded areas is a result of the genetic variability existing in the source populations (from which individuals have been imported) or demographic processes occurring during the introduction of these individuals," comments the expert. The study, which unravels the history behind the global parakeet invasion, also discovered that the North-American and European parakeets have less genetic diversity in their invasive populations than in their native populations. "Genetic data indicates that the source of the individuals which have stocked the invasive populations has a more restricted geographic origin, with little evidence for there having been a significant mix between the populations dwelling in the native geographical area," stresses Carrete. This pattern matches the historical data on the export of individuals for their use as pets, which suggest that the majority of the individuals sold originate from the same area. "However, the invasive populations are more similar amongst themselves than would be expected just from this export data," states the researcher. In effect, the genetic variability observed in the invasive species is low, and suggests the existence of a demographic contraction and a restricted area of origin, but does not support the hypothesis that this invasion has been helped along by the mix and genetic recombination between individuals from multiple source populations. On the contrary, the scientists suggest that the reduced genetic variability observed in these invasive populations would not have negatively affected the success of their colonisation. The reduced variability and great similarity presented in the invasive species studied suggest that convergent selection processes have also played a part in favouring the maintenance of certain haplotypes. "The presence of certain genetic characteristics would be important in explaining the success of the invasive species. Selection processes may also exist which determine this convergence in the genetic pattern of the invasive populations," concludes the scientist. These selection processes during the invasion have not been considered before in these types of studies and could be important in explaining the success of certain invasive species.